A diptych dial of two hinged brass leaves, held shut by a hook clasp. Aside from straight line borders, the sides and base of the instrument are blank. The upper leaf carries a universal equinoctial dial (gnomon missing), lunar volvelles, and a table of latitudes. The outer face has a scale of hours 3 to 12 to 9 surrounding a scale for the age of the moon 0 to 29[1/2]. A central volvelle is marked with radiating hour lines 1 to 12, 1 to 12. In the corners around the circular scales are two cherub heads and foliage decoration. Above the dial is a table of the latitudes of 12 German and Central European cities. The reverse has its outer scale of hours 6 to 12 to 6 for autumn and winter use, again surrounding a scale for the age of the moon 0 - 29[1/2] and a central volvelle marked with radiating hour lines 1 to 12, 1 to 12. In the fixed hour ring is the signature 'IOHANN [star] GEBHART'. 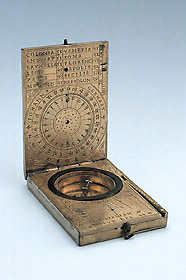 Above the dial is a table of the latitudes of twelve additional European cities. Alongside is the notched scale of degrees of latitudes 20 to 70, divided to 10 and 2, and numbered by 10. The folding strut is recessed in the opposite face. The lower leaf carries a compass of diameter 32 mm surrounded by foliate engraving. The compass base plate has a direction cross marked 'S', 'OR', 'M', 'OC' and an engraved indicator of the variation of the compass. Under the compass is a horizontal pin-gnomon dial for Italian hours 10 to 23, marked 'AT ITALIAM POLVS GRA 44'. The gnomon is missing. For ivory diptych sundials by Gebhart, see P. Gouk, The Ivory Sundials of Nuremberg 1500-1700 (Cambridge, 1988).